the prickly pine trees and soft, fluffy snow! 1. Put 1 teaspoon of water and 6 drops of green food coloring into a zipper baggie. Add 1/2 cup rice, seal the baggie and mix until the rice is completly covered. Spread out on to a piece of wax paper to dry. Your rice will be dry and ready to use in about 1/2 hour to an hour depending on your climate. 2. on your blue paper or cardboard draw a line where the snow and sky will meet. Draw on some trees, you can either just draw triangles or trace around a cookie cutter. spread some glue in each tree shape. 3. Sprinkle some green rice over your glue. Press it down a little bit if you want, and then shake off the excess. Now you have some prickly pine trees! 4. 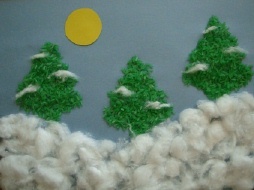 Glue your cotton balls onto the ground, don't forget to put some on the trees! 5. Cut out a bright yellow sun from construction paper, and anything else you'd like in your winter scene! This craft will work on regular construction paper, but the rice is a little heavy which is why we recommend using a heavier paper like cardstock. If you don't have any just use a piece of cardboard (like the back of a cereal box) and cover it with construction paper!